Find some of the best Thanksgiving music with these turkey songs and Thanksgiving songs for kids. If you’re looking for the perfect Thanksgiving songs for preschool, we’ve got you covered. Children never get tired of music, whether it’s a reason to dance, a reason to sing, a reason to rest, or a reason to play. 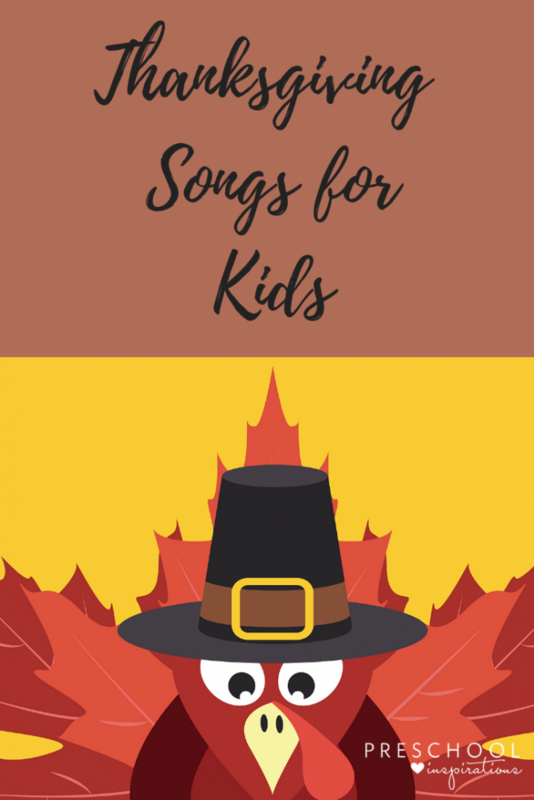 These turkey songs and Thanksgiving songs for kids can be used for all of the above! There’s a bunch of Thanksgiving music on this list from The Learning Station, who has so many songs that we love and sing over and over again. Make sure to check out their Autumn songs playlist! This one is set to the familiar tune “Frère Jacques” which has lots of repetition — an important skill for kids! When a child can quickly learn the tune of a song, it gives them great confidence and joy when they’re singing. Something I love about The Learning Station videos is how they have both genders of voices singing. The main male voice sings the melody, and the female voices sing the same melody an octave (8 notes) higher. It’s great that both genders of kids in your class can hear a voice they can relate to! Although young boys’ voices haven’t changed yet, being able to hear a man’s voice singing the same melody, only lower, will help them find the same melody when their voices do start to change. This great little video has lots of application possibilities: emphasize the beginning math skills, or turn it into a flannel graph or finger play. It’s a perfect turkey song for preschoolers! When it comes to Koo Koo Kangaroo, kids can’t get enough of them! Plus, exposure to lots of different genres of music is important. This fun turkey song has a great dance that reinforces following directions and moving on the beat. This one’s a beautiful classic, especially if you work in a faith-based school or are using Thanksgiving music in your home. Another hit from The Learning Station! This sweet song shares a brief version of the Thanksgiving story then shares lots of relevant reasons for kids to be thankful. The familiar ABC tune will have your kids singing along in no time! It’s a great Thanksgiving song for preschool. I love it when they take classic tunes and turn them into great Thanksgiving songs for kids, and this one is no exception! Having the words on the video is nice reinforcement, or just play the audio to help hone critical listening skills. Clapping/stomping/shouting on the beat is a fantastic skill, and this song makes it easy. This Thanksgiving song is another one that’s sure to get your children up and moving, developing both their brains and their bodies! They’ll love following the instructions to move like the different animals and other things found in nature. The strong beat and repeated refrain help keep the song grounded and familiar. Dr. Jean’s songs are always a favorite! Albuquerque Turkey is no exception as children practice rhyming and dancing to this fun and silly Thanksgiving song for preschoolers. Need some more Thanksgiving activities? Our Children’s Books about Gratitude and Thankfulness will help round out your circle time or story time, and the Turkey Color and Number Match Montessori Activity is great for a math center! Karalee is the blog manager and resident "music education expert" for Preschool Inspirations. She has two girls who attend pre-K and Kindergarten at the same school, and loves subbing there! I love the videos on this page my kids really enjoy the activities !! !